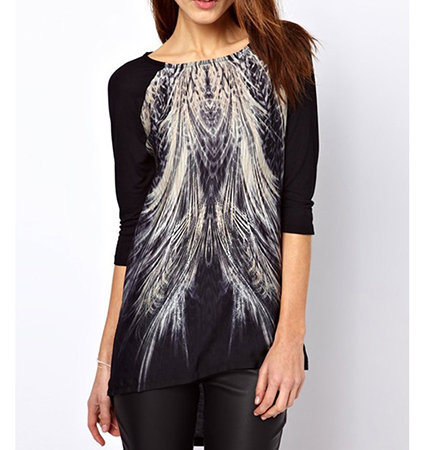 This women’s tunic top provides a dramatic, feminine look that pairs beautifully with jeans and other casual bottoms. It features a simple rounded neckline and flattering three quarter length sleeves. A delicate white feather logo appears over the entire front of the tunic’s bodice. The hemline of this tunic is elliptical, with the front and back of the garment longer than the sides. This tunic is machine washable in warm water and may be tumbled dry on a low heat setting. It is available for purchase in sizes Small, Medium and Large.